Two Wheel Oklahoma: Why Do Motorcycles Pay Tolls? Why Do Motorcycles Pay Tolls? Chances are if you live in Oklahoma you have traveled our state's many turnpikes. If you're like me you may have wondered why the toll for motorcycles is the same as the Hummer in the next lane. Seems like my 489-pound motorcycle would cause less damage to the pavement, reduce congestion and make everyone's turnpike commute a less stressful experience. Why isn't the toll for me and my motorcycle cheaper? Heck, why am I paying a toll at all? The tolls are based on axles- something most of us have but few could define. Murkier still is how the number of axles relates to road use or wear-and-tear. To understand the "logic" behind this pricing structure requires a little history. The Oklahoma Turnpike Authority was created in 1947 to build the first toll road in Oklahoma, the Turner Turnpike between Tulsa and Oklahoma City. This was the postwar boom and America's nascent interstate highway system was beginning it's cross-country trek. When the turnpike opened in 1953 the gameplan was for the road to become a free road once the original bonds were retired. Ironically the original language also called for dissolution of the turnpike authority. But that's not quite how it happened. Instead the Will Rogers Turnpike, between Tulsa and Miami, opened in 1957 and the turnpike fad just kept on rolling. All of the turnpikes use a "per axle" toll scheme. This is partly due to the technology that was readily available in the Fifties. Back then it was common to see metal trigger switches embedded in roadways, especially at intersections to trigger traffic lights. This same concept was applied to vehicles passing through the toll booths on Oklahoma's turnpike gates. Pa-klunk, pa-klunk goes the car over the sensor- that's two axles. Towing a trailer makes another pa-klunk, so the toll booth operator knows to charge you for three axles. Nearly sixty years later technology has changed nearly every aspect of our modern lives. 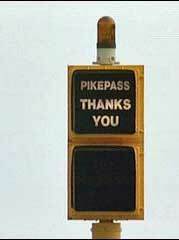 The turnpikes now offer electronic toll tags that allow Pike Pass subscribers to zip right through toll plazas. But the tolls are still calculated on the pa-klunk basis. The fact is it would require some extensive redesign to make the turnpike tolls more equitable. Using weight, a common method for heavy trucks, would require expensive scales at every toll plaza. And the fact that a small car still occupies the same lane as a large pickup makes the weight argument less feasible. But motorcycles... that's a different story. The technology of the Pike Pass system allows the Oklahoma Turnpike Authority to monitor a vehicle passing through the toll plazas. The system is smart enough to "find" the toll tag on your windshield, scan the identifying data, log a transaction and/or alert the system to a violation. Some checkpoints can even photograph your license tag. I submit that it would not be a difficult matter for that same system to distinguish the difference between a 6-foot wide automobile and my 2-foot wide motorcycle. I bet it would be even easier if I was not riding in the center of the lane. Let's say the lane was even painted with motorcycle-only stripes to make it easier on the scanner. The cost to implement a "bikes are free" policy would be negligible. In fact there may be Federal incentives available to defray the initial costs, and the savings in highway maintenance due to the decrease in overall tonnage would surely make it a net gain in short order. Large cities have High Occupancy Vehicle (HOV) lanes to reward drivers who reduce congestion, use less gas and defray traffic jams. Motorcycles, regardless of their occupancy, are always eligible for these HOV lanes. The same idea should be applied to our turnpike system to encourage the use of motorcycle and scooters as the efficient transportation option they are. Oh wait, the real reason they charge motorcycles is because THEY CAN! Motorcycles are more respected in Europe, and road tolls reflect this. In fact, the toll bridge across the Severn Estuary is free for motorcycles - the toll guy looked at me strangely when I tried to pay!! So you are saying that you would share your lane with a car? My motorcycle may take up less space than a car, but that doesn't mean that I want a car to crowd me more than it would another car. Please, give me the same room you would another car. I much prefer a buffer zone between my 600lb bike and your 6000lb truck. My motorcycle may cause less wear and tear on the road surface that a Volkswagen Beatle, but the Beatle causes less wear than a Hummer H3, which causes less wear than an Hummer H2, which causes less wear than a Dodge Ram Megacab 1Ton Dualie that is empty, which causes less wear than a Dodge Ram Megacab 1Ton Dualie that is fully loaded. For that matter, a smaller vehicle may cause more wear and tear when fully loaded than a larger vehicle that is empty. Hence, the toll for trucks based on weight. A fully loaded semi can weigh more than 80,000 pounds. An empty one weighs much less. The Toll Authority has tried to simplify this by setting up some general categories that vehicles fall into. I agree that motorcycles should be their own category with lower rates, but not because they take up less space. I want cars on the turnpike to give me the same space they give other cars. Motorcycles should be charged less because they usually have only two tires in contact with the road and weigh at least one forth that of the average car and cause less wear and tear on the roadway. It's truly a concept long overdue. It would be easy for the state to implement this small incentive to increase ridership. The benefits are obvious. So, how do we go about getting this changed? Petitions, find a friendly legislator, outright insurrection?? As one Rex to another, let's go! "So you are saying that you would share your lane with a car?" My point regarding lane usage was merely to illustrate the point that motorcycles reduce traffic congestion by taking up less space, moving around obstacles (cars) more easily and increased visibility. "So, how do we go about getting this changed?" Maybe we could persuade ABATE to consider getting behind it? A state legislator once told me the motorcycling community had one of the best organized coalitions he had seen in Oklahoma City. My impression is they're fixated on the anti-helmet argument. "The tolls are based on axles- something most of us have but few could define." For real? I'm sharing the road with people that can't understand this? So this would create a new toll price level? Which in turn will create the need for new signage, updated firmware, printing and new software programming. I applaud the effort but can't help but wonder how many "single axle vehicles" will have to pass through the system to pay for those changes. It still seems like we'd all be money ahead if we just waived the toll altogether.